Get your FREE report HERE to learn if your vehicle's airbag had been previously deployed! It is very important not to ignore the Air Bag warning light when it comes on your vehicle's dash (also known as Supplemental Restraint System (SRS) Warning Light), because it is signaling that something is wrong. Any check engine or other dash light should always be checked out as soon as possible. And when it comes to your air bag system, you want to make sure it's performing correctly so it works for you and your family when you need it. Please call us to schedule an evaluation of your SRS/Air Bag warning light so we can pinpoint the problem for you and recommend the proper repair. 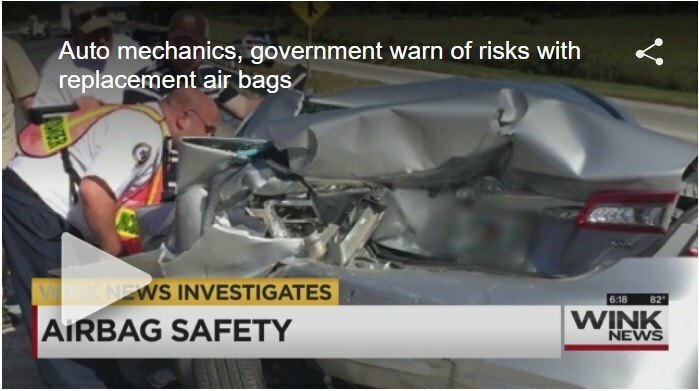 WATCH US on WINK-TV NEWS -- IMPORTANT NEWS STORY ABOUT AIR BAG SAFETY!